Elon Musk with a semi. Goddammit Malcolm! Fix the internet like Tony told you to!1 This is getting embarrassing! It’s not like I’m in the middle of nowhere! And no, Adelaide is not in the middle of nowhere! It’s only at its edge! Fortunately, I didn’t have to wait too long for electric trucking with Elon to appear on Youtube. Now that I’m done complaining, I’ll tell you about the presentation. First off, it looks awesome. This was a surprise because Tesla is well known for its incredibly ugly products. Avert your eyes or risk being turned to stone by this cavalcade of ugly!!! The driver sits in a central position like on a lawn mower, a zamboni, or a horse. (Unless the horse is drunk and you need to compensate.) I like this a lot because it means Australia won’t need to wait for a version to come out with the steering wheel on the right side. There is room for a single passenger on a folding jump seat to the right and behind the driver. Elon said it would outperform any diesel truck on the road and when fully loaded, will go from zero to 60 miles an hour in 20 seconds. This means it can out drag a classic Datsun. When it comes to its performance, I have no trouble at all believing what Elon says. This is because electric motors have plenty of torque and diesel trucks can have up to 18 gears to work through while the Tesla truck has zero. You just put your foot down and go. Elon says it comes in 480 km and 800 km range versions and they’ll do those distances with a full load in a worse case scenario. And now I’ve stopped believing Elon Musk. That didn’t take long, did it? I’ll go into why I have doubts later. We were not told the capacity of its battery, but if you believe the Tesla site where it says it uses less than 1.25 kilowatt-hours per kilometer then a battery that provides 800 kilometers would be around one megawatt-hour in capacity. No mention was made of battery swapping so I am sure that’s not available, but what it will have is MEGACHARGING!!! which Elon says can provide 640 kilometers of range in 30 minutes. That’s a lot of MEGACHARGING!!! and with losses these MEGACHARGERS!!! would have to provide over 1.6 megawatts of electrical power. No mention of price was made, but Elon did say its total cost of operation would be 20% less than a diesel truck. Even if you assume that Elon is fibbing 20% and it will only break even, in Australia diesel costs 50% more than in the US, so the economics of electric trucking will be better here. The truck will apparently go into production in 2019. Hopefully it won’t be plagued with the problems of their Model 3 passenger car which has had a glacially slow roll out and is months behind schedule. Apparently they decided to skip the months of testing every manufacturer carries out before before putting a completely new car model into mass production. This decision was very courageous and did not turn out well for them. But this is Tesla we are talking about, a company that does things at ludicrous speed and I’m sure that in a few month’s time the model 3 will be ready for launch. Half a year after it was. Hopefully things will go more smoothly for their big truck. While 800 kilometers range may sound good to people who only drive cars, to those who actually buy trucks I’m afraid it sounds piddly, because it’s not unusual for diesel trucks to have ranges of 2,000 km or more. It’s a pity Elon had to MEGAGILD!!! that lily, because if he had simply held off describing it as a long range truck I would have been amazed when he announced its range was 800 kilometers, as that is much more than I expected. Unfortunately, I don’t believe Elon when he says its range is 800 km. In the past Elon Musk has made statements that can’t be taken at face value. Hopefully this is not one of those times — but I sure as hell think it is. I’m going to be generous here and assume Elon doesn’t know what the phase “worse case scenario” means. What if the truck has to climb a mountain range or drive into 50 kilometer headwinds all day? But maybe what he actually said was “wurst case scenario” and rather than carrying 27 tonnes of cargo the truck is only hauling one case of German sausages. But what Elon’s quote above appears to make it clear the truck can travel 800 km (500 miles) with a maximum load at around 104 kilometers an hour (60 miles an hour). But the low figure we are given on the Tesla site of battery energy use of less than 1.25 kilowatt-hours per kilometer makes me think this is not true, because under normal circumstances, let alone a worse case scenario, this should not be possible. Because the physics of it makes it seem very unlikely to me that the truck’s real range is 800 km when fully loaded, I think Elon has left himself a way to wiggle out of his previous statement, because he doesn’t mention picking up a load. So he could mean the truck is capable of driving 400 km at around 104 km an hour with a full load, which for a single trailer diesel semi in the United States would be around 27+ tonnes of cargo, and then after the truck has dropped it off it is capable of driving another 400 km with an empty trailer. So I think likely that the actual range is not what Elon said at first, but is 400 km driving at maximum weight for the United States — which is 36 tonnes for truck, trailer, and cargo — plus 400 km with no cargo. The shape of the cab is going to make for some interesting kangaroo impacts. Also, I’m actually surprised the windscreen wiper isn’t on a Go Go Gadget arm that only comes out when needed. Fortunately, it is not too difficult to estimate how much energy an electric truck actually requires to haul a full load. Using a Truck Operating Cost Calculator I see an Australian single trailer truck carrying an average of 24 tonnes of goods will get 2.1 kilometers per liter of diesel. This is less than the 27+ tonnes of stuff a fully loaded diesel truck would haul in the United States, but that’s okay, I’ll spot Tesla that much. Because there are 35.8 megajoules of chemical energy in one liter of diesel the truck consumes 17 megajoules per kilometer. Modern diesel truck engines are around 48% efficient at supplying power but electric motors are around 90% efficient. This means they only require 53% as much energy. They also don’t have idling losses and can make use of regenerative braking. However, a diesel truck will get lighter the more fuel it uses, while an electric truck always has to lug around a large, heavy battery that’s the same weight whether drained or fully charged. I’ll come back to the battery’s weight, but for now I’ll just assume an electric truck requires half as much energy per kilometer as a diesel one, which comes to 8.5 megajoules per kilometer. Because there are 3.6 megajoules in a kilowatt-hour the Tesla truck will require around 2.4 kilowatt-hours of battery electricity per kilometer. But Elon Musk said the Tesla truck has such a great range because of its superb aerodynamics and its coefficient of drag is 0.36 which is around half that of a normal semitrailer. One estimate of the energy lost by trucks to air resistance is 20%. But a truck moving at 104 kilometers an hour can lose over 50% of its energy to ploughing through air. Generally a truck’s average speed will be under 104 kilometers an hour, but I will optimistically assume the Tesla truck will lose 25% less energy than the diesel truck. This is despite the fact that Australian trucks require large, unaerodynamic bull bars because of the of the existence of bulls. I also wonder if its drag coefficient will be so low after it has splattered through one million insects. But I’ll ignore the bug guts and assume Tesla can make some kind of aerodynamic bull bar. So all up, with optimistic assumptions, a loaded Tesla truck will require around 1.8 kilowatt-hours per kilometer. This is much higher than the “below 1.25 kilowatt-hours” figure the Tesla site gives and so I do not think the truck’s range when fully loaded is 800 kilometers. Instead it might be two-thirds of that and closer to 500 kilometers. Tesla might also be assuming the truck and trailer will have ultra low rolling resistance tires, but they could also be put on a diesel truck. Also, in his presentation, Elon Musk never mentioned the elephant in the room. Or rather, the elephant on the truck, which is the weight of the battery. The Tesla site says their truck uses less than 1.25 kilowatt-hours per kilometer. So if the actual figure is 1.2 kilowatt-hours and its range is 800 km as Elon says, then its battery capacity must be at least 960 kilowatt-hours. Let’s make that a nice round 1,000 kilowatt-hours or 1 megawatt-hour. The 85 kilowatt-hour Tesla S battery pack is 540 kilograms. That comes to 6.35 kilograms per kilowatt-hour. If it is assumed over the next two years Tesla can increase the specific energy of the battery by an optimistic 20% then it will weigh 5 kilograms per kilowatt-hour. That’s a total of 5 tonnes for the 1 megawatt-hour battery, which is more than the average weight of adult African elephants. The good news is, because electric motors are light and electric trucks don’t require transmissions, exhaust systems, fuel tanks, and many other components, this may save them close to two tonnes of weight. The Tesla truck uses a carbon fiber body to further reduce its weight, but as that could also be used to reduce the weight of a diesel truck, the Tesla truck is likely to weigh over 4 tonnes more than a diesel of comparable construction. If we assume the carbon fiber construction reduces its weight by over one tonne compared to a typical diesel truck it is still likely to weigh around three tonnes more. This will reduce the maximum weight a single trailer semi can carry by an equal amount. This is over a 10% reduction in maximum cargo weight. The short range of the Tesla truck isn’t a huge problem — for now. This is because there are plenty of short routes in the world where Tesla trucks can start hauling loads without a problem. For example a considerable number of electric semis could be kept busy rolling back and forth all day between Brisbane and Toowoomba where the round trip distance is only 256 kilometers. I can tell you now, that electric motor is going to be great for getting up the Toowoomba range. There are no gears so you can just floor it all the way. If the load is heavy it won’t fly up the range, but it won’t crawl like diesels do. And trucks leaving Toowoomba won’t need a full charge as they can get that using regenerative braking going down the range. What the short range will complicate is driver scheduling and rest periods. But while they won’t drive themselves at first, it may not be too long before truck drivers will need to hope their skills will turn out to be highly valued in other parts of the economy. If a total of 6 cup holders can’t make America great again, nothing will! Musk says the total cost of ownership will be 20% less than for diesel trucks. Since he hasn’t said how much the trucks will cost or how long the batteries will last I have no way of determining if this is correct. But I will mention the cost of diesel in Australia is 50% higher than in the United States and it is much higher in Europe. So even if Musk is exaggerating, Tesla electric trucks are still likely to pay for themselves in many countries, even without accounting for their air quality benefits. While I can’t know how much Tesla trucks will cost to run, it’s not too difficult to crunch some numbers and come up with a back of the envelope calculation to see if electric trucks are likely to pay for themselves here. What we can be certain of is, as soon as electric trucks clearly beat diesels on price they will start to take over, as the road freight business is very focused on the bottom line. Diesel is now around $1.40 a liter. With the fuel rebate it comes to about $1.28 and for the single trailer diesel truck example used earlier it will come to 61 cents per kilometer driven. I estimated that, at best, a loaded electric truck will consume 1.8 kilowatt-hours per kilometer, but energy will be lost charging the batteries. When a Tesla S sports car uses a Tesla Supercharger the losses can be over 25%. The losses from a MEGACHARGER!!! are also likely to be high, but because truck owners care more about cutting costs than sports car owners (if they were careful with money they wouldn’t own a sports car in the first place) I will assume steps will be taken to minimizes losses and they will only be 20%. This means an electric truck will require 2.16 kilowatt-hours of grid electricity or distributed solar electricity per kilometer. Electricity in Australia is not cheap, but there is considerable variation across the country. 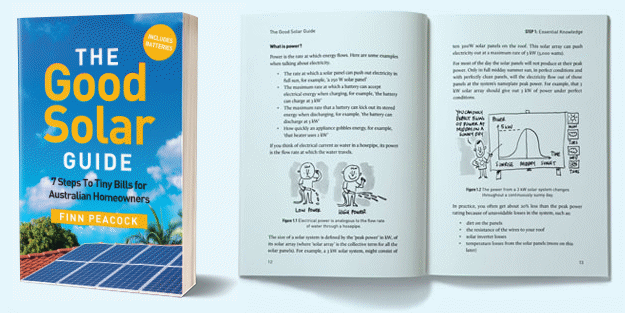 Large commercial users also pay far less than households do and their costs will be even lower if they can do a considerable amount of charging late at night, or as solar capacity expands, in the middle of the day. It is now also very cheap for companies with roof space to install large commercial solar systems that can provide electricity at low cost — although MEGACHARGING!!! will consume far more power than all but the most massive commercial solar systems can provide. But assuming electric trucks will mostly be used where electricity is cheaper and the average cost of commercial electricity used won’t be high, I will use 15 cents a kilowatt-hour as the average cost of electricity used to charge truck batteries. This means the it will cost 32 cents to drive one kilometer using electricity, which is much better than the 61 cents for diesel. However, there is also the cost of wear and tear on the batteries. This will depend upon battery prices and how durable they are. The good news is Tesla battery packs may now only cost $200 per kilowatt-hour and Elon says he expects them to be around $130 by the end of 2020. While Elon’s predictions rarely arrive on time, Chinese manufacturers may get there sooner. I will assume they’ll cost $150 per kilowatt-hour. I don’t know if it is true in practice. A car or truck is a much harsher environment for batteries. But if I assume truck batteries can be cycled 1,000 times or over 1,000 times once battery degradation is figured in, then the cost per kilowatt-hour of stored electricity would come to 15 cents which would be 27 cents per kilometer using the optimistic figure of 1.8 kilowatt-hours per kilometer. With the 32 cent cost of electricity, the total would come to 59 cents which is almost the same as diesel. But with an improvement in batteries or an increase in oil prices, electric trucking would clearly win on price. One cost advantage electric trucks will have is in maintenance because electric motors are far simpler and longer lasting than diesel ones. Maintenance costs, not including tire replacement, are roughly 14 cents per kilometer for diesels and while it will probably take time to perfect the reliability of electric trucks, as new products are more likely to have bugs and flaws than tried and tested ones, I think they could cut maintenance costs by more than half, reducing costs by over 7 cents a kilometer. So while electric trucks have some cost disadvantages such as the need to pay for the battery upfront and potential increases in labor costs due to the need to spend time charging, it does seem likely electric trucks could pay for themselves, provided batteries continue to fall in price and improve in reliability, as they have over the past several years. Apart from electric trucks there is not much in the way of effective alternatives. Hybrid trucks have been built and have been used in the mining industry for a long time. They have the advantages of reduced maintenance and fuel costs. However, because trucks spend most of their time on highways instead of in town, the savings from hybrid technology are not as great as for hybrid cars and may only reduce fuel costs by around 30%. This doesn’t mean hybrid trucks won’t be built, but as batteries improve they are unlikely to be able to provide the same cost advantages. There are natural gas powered trucks, but their popularity will depend on Malcolm Turnbull keeping gas prices down. Fuel cell trucks, whether powered by hydrogen or other fuel have not yet demonstrated the ability to compete on price and I don’t think they will. In Australia electric vehicles are subsidized because they don’t pay the excise on petrol or diesel. On the other hand, diesel and petrol vehicles are subsidized because they don’t pay the cost of the environmental and health damage they cause. But, if electric vehicles were required to pay the equivalent of the fuel excise per kilometer traveled, it would it would really hurt their economics. 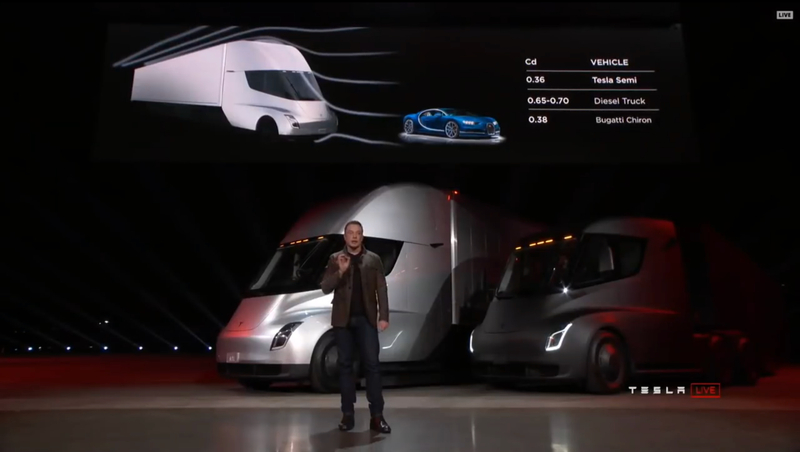 One thing Elon Musk did not mention in his presentation is that electric trucking is more likely to help big business than independent owner operators or small trucking businesses. The reason is the higher upfront cost of electric trucks and lower operating costs makes the ability to borrow cheaply more important and here larger companies usually have an advantage. In addition, the larger the company, the less they are likely to pay for electricity and the more trucks they have the more use they will get out of any MEGACHARGERS!!! they install. As an additional bonus, Tesla trucks are made to be able to travel close behind each other to reduce air resistance, letting those with more trucks reduce costs further. If oil prices rise electric trucks can save us from increasing transport costs, and when oil prices fall thanks to all the electric vehicles saving us from high transport costs, they can help save us from melting icecaps and choking on pollution. As diesel engines are terrible for air quality, electric trucks have the ability to make our lives cleaner, greener, and also quieter. Just watch out for idiots who buy only the electric truck and no trailer so they can drive around town and hoon away from the lights at ludicrous speed. Conventional trucks have already adopted many of the means of drag reduction, including low loss tyres. Convoying trucks can reduce the drag for the following vehicles to ~50%, but only if the trucks are following within 3m, where automation is necessary. Even so, the lead truck feels the full brunt, where its battery would limit the range of the convoy. A low loss diesel consumes around 2.5kWh/mile. Halving that figure, may require some proof. MW charging isn’t so mush a technical limit, as the cost of providing it. The present Superchargers contain 12 x 10kW ( level 2) chargers in one box, and not something extraordinary. athomas; lead trucks will ‘limit the range of the convoy’. Well, have you ever seen a bicycle race? They change the lead when the leader gets tired. So I expect convoys to go even farther than we expect. the weight is the killer here as 3-4 ton over on the truck means it cant carry a conventional trailer load. the main aero reduction they will get it from not having a radiator acting like a parachute on the front of the truck. But i think it might be a slow take up as large companies that got fleet’s of hybrid trucks for town work are going back to conventional trucks due to the repair bill’s and lack of reliability the hybrid system had. to make this work they need to focus on weight and matching a conventional truck rather then range and have quick replacement swap over battery system, if they did this then they could be used as dock truck’s local semi work and could even be used to pick up a trailer from a warehouse drop off at a truck stop on the edge of the city where a conventional truck could then haul it between major city’s where range become’s an issue. Thanks Ron, an excellent article; but I am a bit confused by your Tesla truck critique in light of another recent Tesla critique (last week) which is not about electric trucks but other Tesla issues that might cast some doubt (at least for some objective and professionally detached people I would guess) about the overall Tesla reality going forward. The global energy generation technologies reality show and sometimes near hysterical media blitz, seems to be getting a bit noisy and confusing some are saying; and Tesla is a stark case in point. Have you a view to share Ron on this subject, and in particular how the average ordinary global citizen (and that’s about 10 billion of us) who might have an interest and concern in an enduring global power generation technology moving forward that would satisfy the global energy imperative of:- ‘providing all global citizens in perpetuity with; enduring, abundant, clean, safe, low cost and highly reliable power, to power homes, businesses, factories, infra structure development, industrialisation of undeveloped nations through new age energy intensive industries, to modern day standards’: that simultaneously would reduce Global Greenhouse Gasses (GHG) to insignificant proportions: might evaluate the amazing Tesla truck .mp4 graphic, in the overall global energy future context. I think this is the real global discussion at the moment that we should all be demanding of our energy technology commentators and practitioners, policy makers, national leaders, and key global corporations and decision makers. Let’s talk electric trucks, solar roof tiles, ….., ……, etc etc a little bit further down the track Elon, and get back to the main game please. Seekingalpha always seem to publish negative articles on Tesla. However, for every negative article there are positive ones. Opinions are like belly buttons, everyone has one. I have not been able to find many articles based on hard data and proper analytical methodology though. Most are just based on anecdotes and opinions. Tesla has always had its naysayers. Yet here they are 10 years later with cars in production and selling. Tesla sets a date, sure it may not be met but it at least it gives everyone involved in the project something to work towards. If you don’t set a deadline then things don’t move. You absolutely correct Dennis and what is also important is for ordinary interested global citizens such as you and me, industry practitioners, commentators and experts alike, to develop some skills about professional detachment about any given subject if possible, to give themselves at least a fighting chance to analise and evaluate information as objectively as possible, and as they would hope for and expect from others. These are the attrubutes that generally lead us all to, and keep things ultimately on an even keel Dennis to coin a phrase from my navy days. Pretty sure Musk said guaranteed 7c/kWh at Tesla charging stations in he presentation. Also mentioned something about them all being solar powered. That’s in the United States. We’ll have to wait and see what happens to the cost of electricity here, but as solar and wind capacity expand there will be great opportunites to charge up for next to nothing or literally nothing. Unless the trucks have quick swap battery packs the 8+ hours of downtime to recharge would make it uneconomical. Thus the real cost per truck would need to include 4 battery packs per truck to enable the same refuelling downtime as diesels. Not to mention extra staff and infrastructure to support the charging / exchange stations. As for new aerodynamic efficiency, there’s no reason why new diesel powered trucks can’t imitate this and be equally so. The real value of electric trucks is their near zero environmental impact. Niels – Did you read the article? SUPER-MEGA-CHARGING!!! 80% range add in 30 minutes. That will work for a 1000 mile day run, with two 30 minute breaks somewhere along the way. The powers that be here seem to be doing their best to make diesel power un affordable even for the much smaller 4WD leisure community with their slavish adoption of Euro 5….6 etc. restrictions. It is now essential to fit and service an array of expensive add on’s if you want your vehicle to survive for the life it deserves after having paid about a $5000 premium for the diesel motor in the first place. First the latest high pressure common rail models cannot tolerate even a small amount of water in the fuel without destroying the priceless high pressure fuel pump and $1000 each injectors so first you need a supplementary fuel filter down to 5 microns. The new crankcase oil fumes recirculation will soon clog up the intake system causing an expensive repair or breakdown so a catch can is a must. Then we have ad blue to clean up the exhaust which must be kept full or the engine will go in to limp home mode and goes in a separate filler cap. Purchase and maintenance of all this guff is not cheap but essential. No wonder the current interest in returning to electric propulsion. I am old enough to have had my milk delivered by it a long time ago! Hold on…….so we need electric powered, long haul, heavy cargo transport that can platoon and has low rolling resistance wheels? …. I got it! Lets call it a “TRAIN”. Why? Because trucks can go anywhere there is a road. Trains need rails. Also because roads can serve a dual purpose – passenger cars and goods transport. It’s bloody obvious. @Bob you are precisely correct on this one, and countries looking back knowing what they know now, would definitely have focused more on modern technology rail transport stratagies than unsustainable and problematic road transport. Predictably the countries that are benefitting most from this recent technology era strategy today are the poorer countries and in particular China. I do most of my normal day to day business travel in China and Taiwan on high speed rail and have for several years now. A lot has been learned in that time about modern rail stratagies for commercial rail as well as commuter rail, and the emerging economies of nation states of Afruca will be the first to experience the full force of this modern technology through the China Belt and Road initiative which is taking shape at the seaport development level first throughout key regions in Asia, Africa and the Middle East, and the first priority major industry inititives planned are the electrification of African nations (obviously) followed by the infrastructure development for the manufacture; development and implementation of an “all of Africa” high speed freight and commuter rail network. So yes what you visualise Bob is correct in priciple, except the solar power part is way off target. Can Australia ever be a beneficiary of modern interlinked rail technologies, other than small scale modernised under city metro type commuter systems? No. We dont have the population base or economic development future prospects, as well as other key reasons, to think about such concepts here Bob. There are other more cost effective transport alternatives coming into focus that will be more suited to our region and our economic reality. @ BOB re: trains… they sort of are already (well, in Australia and NZ at least. Don’t know about elsewhere). What they (“they” in this case being the international logistics industries) are doing is to build big intermodal parks. The “intermodal” bit refers to the mode of transport. So an international shipping container is offloaded from a ship and is sent by train to the further reaches / outskirts of a city, e.g. Moorebank Intermodal Park, where it is offloaded from the train and is then put onto a truck. The truck then drives to/from the intermodal park to/from the point of delivery. And, of course, it works in reverse – the cargo is generated somewhere in say the Australian Outback, the truck driver picks it up and takes it to the local intermodal station e.g. Parkes in country NSW. Then there is a choice of where it can go from there. Once the Inland Rail is built (it’s a giant freight track) the cargo can then be transported to Brisbane, Sydney or Melbourne for export. There are also smaller inner-city intermodal hubs serving the near city, such as Chullora (Sydney). I imagine, based on Ron’s article and the comments given here, that electric trucks will be a real boon for the local populace owing to the massive reduction in human health-harming emissions (particulate matters, Nitrous Oxides, sulfur oxides and volatile organic compounds, among others). Why not use the Powerwall cycle life to calculate the cycle life of Tesla lorry batteries? Are B-double trucks illegal in USA? The Tesla S base model 60 kilowatt battery is only warranted for enough kilometers to provide around 614 full cycles at its original capacity when new. This is why I went for 1,000 cycles. Personally, I think by 2020 electric truck batteries won’t have a problem exceeding this, but I don’t have good evidence they can do it at the moment and so I didn’t use a more optimistic figure. But if they will last 5,000 cycles then the economics get a lot better. Tesla currently offers an 8 year unlimited kilometer warranty for larger Tesla S battery packs, but I didn’t base my estimate on that because trucks do a lot more kilometers than sports cars and they spend a lot more time close to maximum power output than passenger cars. Rules on multiple trailer use in the United States vary state by state. I see no reason why a Tesla truck couldn’t pull two loaded trailers, particularly on a flat route, but its range will be reduced. The 60kWh battery contains 75kWh of cells, but is limited by software. 60MWh, which would equate to 800 cycles of the 75kWh battery. So far, Model S’ used as taxis, or otherwise covering large distances in a few years, see battery failure at 200,000 miles. Calendar life will limit the lesser cases, and why there is that 8 year warranty. US Class 8 semi’s travel an average of more than 65,000 miles/year. Battery replacement will be quite frequent. Thanks for that. So at the moment we are looking at about 800 full cycles of the Tesla truck battery with their current technology – ignoring reduction in battery capacity over time and assuming that the trucking life with frequent megacharging is no harder on the battery pack than being used in a taxi. Musk release date 2019. Actual release date more like 2020. A lot can change in terms of batteries, electric motors and other technology, even within a few years. Batteries are falling in cost and improving in capacity. Look at the existing Tesla cars. They went from 85kwh to 100kwh within a few years. Did you consider that batteries and a motor or two could be added to the trailer? It might not even need to be much, just enough to assist with pulling power. True, there are weight considerations but it is an option which I am sure Tesla will test. I prefer to be optimistic. There are lots of smart people at Tesla and Space X. They will make it work. No technology is perfect. We just have to make the pros outweigh the cons and teach people a new way of doing things. E.g. Range anxiety – most trips are done around a person’s local area within 100km. Plug in the car overnight like most people do with their phone/tablet and they will have plenty of range. Just a change in thinking/habit required. I for one will be glad never having to step foot in a fuel station again. I hate the smell of diesel, petrol and oil. I know the trailers the prime movers haul change all the time, get dropped off, etc but I wonder whether you could have flat solar panels on the entire length of the rear trailer roof top and charge the batteries from the sun while driving / sitting idle etc ? And further increasing the range. A big fleet that had all the same trailers ie. big supermarket chain, linfox etc could possibly do this as long as you could house all the other equipment needed to charge the batteries. It could be done and it might be great for refrigerated trailers, but even if Elon Musk is right about how little energy the truck needs at highway speeds, the entire roof of the trailer under full sunlight with high efficiency solar panels will still provide less than 4% of the power a truck consumes at 104 km an hour. But every little bit helps, so it’s not a bad idea. Ronald you went to an awfull lot of trouble to discuss the ins and outs of Elons claims for the truck. Which was interesting. Elon has a lot of credibility which he has earned by putting his money where his mouth is and with practicle results is challenging the vested big businesses and their monopolistic rent seeking behavior. So more strength to him and Tesla. IMHO a far more fascinating effect of his truck just like his Powerwall battery and energy generation is its potential to transform the BIG picture of the transport needs of our society. It’s figuratively like the cue ball in a game of billiards striking the stack very hard and all the red balls scattering to the four corners of the table. The result will be profound. specified 800km range, is about 1MWh. My Answer: Fully loaded diesel trucks burn around half a liter of fuel per kilometer which releases around 1 kilogram of CO2. With refinery and transportation emissions its closer to 1.2 kilograms. If an electric truck uses 2.2 kilowatt-hours of grid electricity per kilometer and the grid electricity is 85% coal and 15% renewable around 1.8 kilograms of CO2 will be released and roughly around 0.67 kilograms of coal will be burnt per kilometer. That comes to around half a tonne of coal over 800 kilometers. Dawson MP George Christensen was recently reported saying he thinks it’s fair if the federal government (ie. the taxpayer) ‘coughs up’ to get a new coal-fired power station to the investment stage. If this uneconomic plan ever goes ahead, north Queensland residents will also be coughing up – literally. EJA’s coal and health team works with communities in the Hunter Valley, the NSW Central Coast and the Latrobe Valley who are affected by a whole host of health problems directly related to coal-fired electricity. Our report, Toxic and terminal: How the regulation of coal-fired power stations fails Australian communities, is littered with stories of people who live with the burden of coal-fired power. What does that burden feel like? It feels like not being able to get enough air to breathe when you or your kids have an asthma attack. It feels like repeated, regular, throbbing headaches. It feels like nausea. It feels like respiratory disease, lung cancer, heart attacks and stroke. It means babies born with reduced birth weight. It means years of life lost. Coal-fired power station pollution causes and contributes to all these conditions. Communities that live within 100 kilometres of coal-fired power plants know all about it. These illnesses and irritations – not to mention the daily reality of having to wipe coal dust off every flat surface around and often inside your house – are part of life for tens of thousands of households in the Latrobe Valley, the NSW Central Coast and Gladstone because coal-fired power stations emit more than 30 toxic substances and are Australia’s biggest source of fine particles, sulfur dioxide and oxides of nitrogen. Roll on, the trucks that will choke the world (until all electricity is produced from clean energy). I’m surprised that so much of Elon’s focus was on ‘long range’ trucking. Sure, we’ve all seen semi-trailers hurtling down the Hume Highway between Sydney and Melbourne. But these are a tiny percentage of all trucks involved in distribution. Most of the transportation / distribution requirement is short range multi-drop – i.e. deliveries to peoples houses, deliveries to retail stores, deliveries to businesses. A couple of decades ago I used to work for a high profile FMCG ‘fast-moving consumer goods’ company. Every day we would send out up to 100 trucks doing deliveries to the ‘route trade’: multiple drops of 10-20 cases per delivery, to corner stores, service stations, etc; each truck covering just a few suburbs. At the same time, every day we would also do many full semi-trailer load deliveries from our Sydney warehouse to the warehouses of our major bulk customers, such as supermarkets. Most of those delivery destinations were in Sydney also. So even our semi-trailers didn’t need long range to be able to do multiple deliveries per day. Many of the trucks used for multiple deliveries per day, spend much of their time stationary, waiting while products are off-loaded at customer premises, and they would rarely do more than 200km per day. It sure sounds like Elon’s electric trucks are gonna be much more suitable for the vast majority of short-range, multi-drop distribution tasks. Regarding the “more suitable”, are they really going to be any “more suitable” than diesel fuelled trucks (running directly from diesel engines, via the transmission, rather than via an electricity generator, like diesel-electric locomotives and coal-powered “electric” trucks with each loss of energy efficiency at each energy transferral), given the comparisons of emissions, both particulate, and gaseous (“coal-fired power stations emit more than 30 toxic substances and are Australia’s biggest source of fine particles, sulfur dioxide and oxides of nitrogen”) between the fuels that provide the power to make the trucks go?